As in the case of Traditional Testing, Agile Testing also need to cover all the Test Levels. Tests can be fully Manual, fully Automated, Combination of Manual and Automated or Manual supported by Tools. Supporting Development (Support Programming) − Support Programming Tests are used by the Programmers. A Test is a business-facing test if it answers the questions framed with words from business domain. These are understood by the business experts and would interest them so that behavior of the system can be explained in the real time scenario. A Test is a technology-facing test if it answers the questions framed with words from technology domain. The programmers understand what needs to be implemented based on the clarifications on technology. These two aspects of test types can be viewed using the Agile Testing Quadrants defined by Brian Marick. The Agile Testing Quadrants provide a helpful taxonomy to help teams identify, plan and execute the testing needed. Quadrant Q1 − Unit Level, Technology Facing, and supports the developers. Unit tests belong to this Quadrant. These tests can be Automated tests. 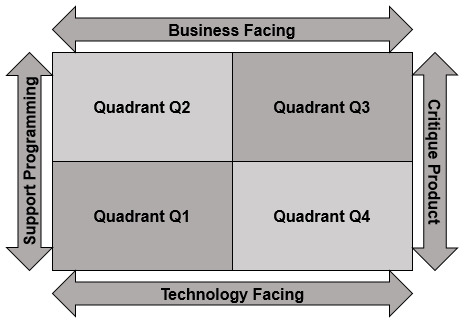 Quadrant Q2 − System level, business facing, and conform product behavior. Functional tests belong to this quadrant. These tests are either manual or automated. Quadrant Q3 − System or User Acceptance Level, Business Facing and focus on real time scenarios. 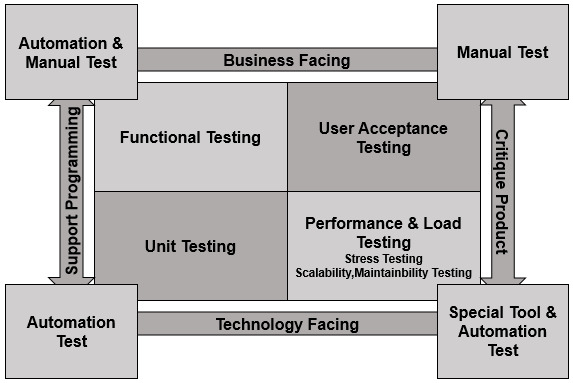 User Acceptance Tests belong to this quadrant. These tests are manual. Quadrant Q4 − System or Operational Acceptance Level, Technology Facing and Focus on Performance, Load, Stress, Maintainability, Scalability Tests. Special tools can be used for these tests along with automation testing.